Once again, many muchos for the SODA trade of last week. Finally out of all three legs. I didn't want to wait for expiration tomorrow and the possible peg at $70.00, following your dictum to not get greedy. 1,000% on SKF - It was a freakin' monster into the center field bleachers! I saw it play out live and squawked it from the StockTwits ID which 14k people follow: Home run trade of the week @philstockworld just knocked cover off ball w $SKF puts. http://bit.ly/piBL Great trade bud! Thanks, I managed to make 2k today so I am happy…and feel like I am finally getting it. New equipment and a quiet place to work helps a lot. I am happy for all the members that took your /NKD advice….that was fun I am sure! coke Take your vitamins…I don't know how you do all this! but, keep it up! You are doing a fantastic job. I think most of us our very well balanced and consequently have learned how to manage through these ever so short declines in the market without panic. I am occasionally stunned when someone who I thought had a good grasp of reality and reason goes entirely off into left field, powered by a thesis that has run out of track. Mish, unfortunately, has succumbed to this sin in his piece "Fractional Reserve Lending Constitutes Fraud"
Fractional Reserve Lending constitutes fraud. The case is irrefutable. Let us distinguish between two separate items: Money and Credit. Money: The product of either growing something, mining something or manufacturing something. "Money" is actual wealth, and comes into being only through creation. Ultimately, all money is traced to the only "free lunch" that exists in this solar system, that is, the power of The Sun, although in many cases (e.g. mining) the activity is in fact discovery of previously-created wealth (by the actions of The Sun) levered through human endeavor. Credit: The granting of purchasing power predicated upon a future promise to pay with money. Mish’s (and others) claim that "all fractional lending is fraudulent" implies that one cannot pledge money to secure credit. That’s obvious BS; let’s put forward a concrete example. That house (and all the products that I used to make it) are in fact money. They were the product of mining, growing, and/or manufacturing. Each of these acts is in fact the creation of money. I was asked to reply to Karl Denninger’s Rebuttal To Mish On Fractional Reserve Lending. Here goes: Denninger does not phrase my arguments correctly on points 2-5, however he thinks they are immaterial so the points are somewhat moot. The crux of the matter is not whether assets are backed by collateral as Denninger suggests, but rather whether the same money has been lent out multiple times. Let’s follow through with a real life example. Fannie Mae makes a loan of $1,000,000. Let’s be more than reasonably fair and assume Fannie Mae issued bonds for the entire amount, not borrowing a single cent into existence. So far there is no fraud. $1,000,000 goes to the home builder. That home builder deposits $1,000,000 into a Bank of America checking account. Ignoring sweeps that would allow Bank of America to loan out every cent, let’s assume BofA keeps 10% in reserves and lends out $900,000 to a new furniture store on the corner strip mall. The furniture store owner buys $900,000 of furniture from a wholesaler. The wholesaler deposits $900,000 into a Citigroup checking account. Again, ignoring the likelihood Citigroup sweeps the whole amount into a savings account thereby able to lend out the entire amount (savings accounts have no reserve requirements), let’s assume that Citigroup keeps 10% in reserves and lends out $810,000 to a High Roller who takes out a home equity loan on his house that is supposedly worth $3,000,000. High Roller buys a yacht from a boating manufacturer for $810,000. The yacht manufacturer deposits $810,000 in a checking account at Wells Fargo. Following the same pattern, Wells Fargo keeps 10% in reserves and lends out $729,000 to a plumbing supply company, because home sales are going gangbusters and the plumbing supplier needs more supplies. I think you can see where this is headed. On the original $1,000,000 this is what FRL allows to be lent out. See where this is going? I am going to arbitrarily stop the chain right there, but the total so far is $5,511,000 out of $1,000,000 was lent out. Karl claims this is not fraudulent because "it’s all backed by assets". Fractional Reserve Lending (FRL) is fraudulent. Indeed, FRL in conjunction with micro-mismanagement of interest rates by the Fed is the root cause of the financial crisis we are in. No it’s not (fraudulent), provided it is performed properly. The latter (Fed argument) I will ignore for now. 1. FRL is not fraud because the lending is backed by assets. 2. FRL is not fraud because it is allowed by law. 3. 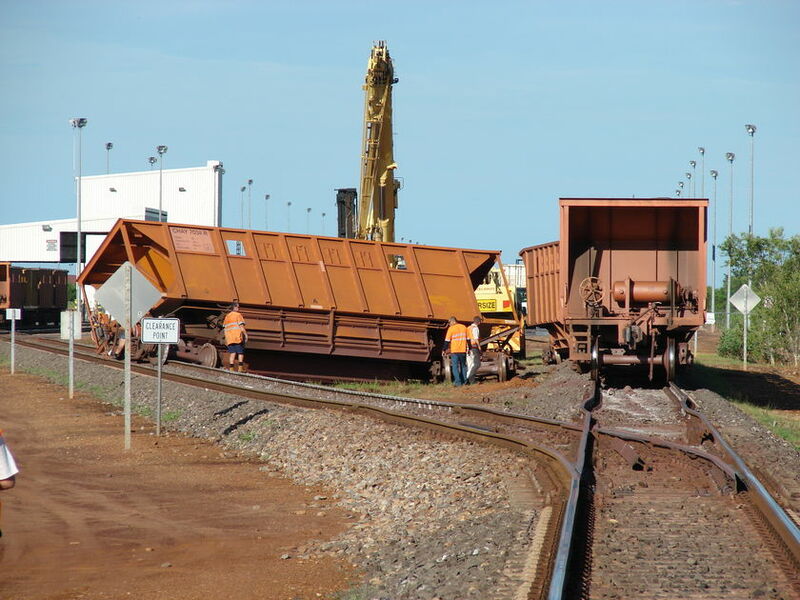 Eliminating FRL would require unwarranted "regulation". 4. No one is harmed by FRL. I’m going to ignore 2 (because whether something is allowed by law doesn’t change whether its fraudulent), #3 is immaterial, #4 does not bear on the question (is it fraudulent) and neither does #5. Instead, I will deal with #1 and dispose of this issue right here and now. We will take a fictional bank that we set up with no capital or assets. That is, it has a balance sheet that has zero on it. We will also simplify this to two transactions, which is sufficient to show the math works; if it works with one transaction it works with 100 – or 10,000. Joe comes into the bank and deposits $10,000. The balance sheet now has $10,000 on the asset side and $10,000 on the liability side. The bank physically has $10,000 that Joe deposited. Jane comes in and borrows $9,000 to buy a car. Jane now has $9,000 that originally belonged to Joe. The bank has a promissory note from Jane and in addition is named as the secured lien-holder on the title to the vehicle, which is shows as an asset. Jane owes the bank $9,000. Now the argument against Fractional Reserve Lending is that it constitutes "printing" money. Australian economist Steve Keen is one of the very few who have called this economic crisis correctly. What distinguishes Keen is that his economic forecasts are based on levels of debt and changes in levels of debt as opposed to money supply, output capacity and other things that led most economists astray. The following video is about 19 minutes long but very much worth listening to in entirety, improving as it goes along. The video may take a while to load but it’s well worth it. Everything below in quotes, until the next bold title is a partial transcript from the video. "If you have a sane economy, and by sane economy I mean one which is not addicted to debt, not a Ponzi economy, then the change in debt each year should contribute a minor amount to demand. 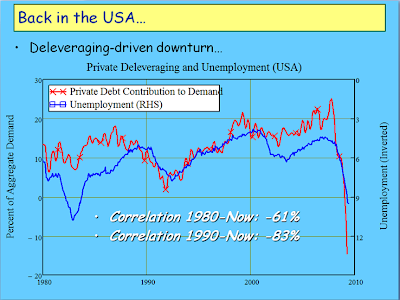 Therefore, if you tried to correlate debt to the level of unemployment you would not find much of a correlation. Unfortunately that is not the economy we live in." "The red line shows the percent contribution that debt contributes to demand and the blue line which is inverted is the unemployment rate." "There should be no correlation if the economy is operating sensibly. Correlation is now at the level of 83%. Because we have a debt driven economy, the change in debt levels each year is the major determinant in the change in economic performance." "Neoclassical economic theory is dangerous. Neoclassical economists completely missed this crisis. 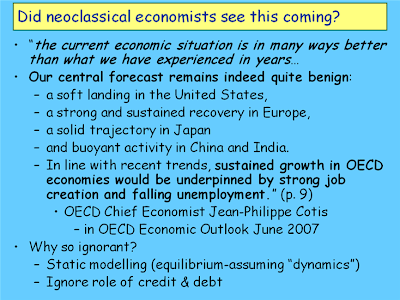 My favorite statement comes from the OECD in its June 2007 report"
" A recent survey trying to find economists who predicted this found 12. And there are 10,000-15,000 economists in the US alone which is why I don’t particularly accept their assurances that everything is OK from now on." "Now why are economists so ignorant? Two major reasons. First of all the type of modeling they do is static where you ignore time, or if you have dynamics you assume they are converging to some nice stable situation in the future. And they ignore almost completely the role of credit and debt." America's newest generation is growing up in a marijuana environment that is unlike anything ever seen in the U.S.
Apple has added $286 billion in market capitalization over the past 73 trading sessions. That’s $10 million every minute. There are only 11 companies in the United States with a higher valuation than what Apple managed to tack on since January 3rd. The biggest stock in the world gained 43% in under four months. How does something like this happen? Courtesy of Read the Ticker. Please review a collection of WWW browsing results. The information here is delayed by a few months, members get the most recent content. Click for popup. Clear your browser cache if image is not showing.